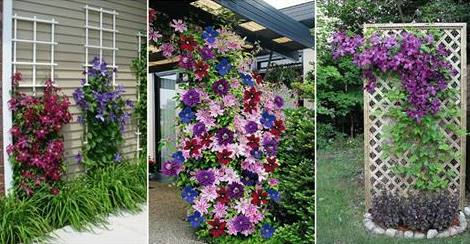 Clematis plants are definitely among the most popular vines grown in the home landscape. They feature woody vines as well as evergreen varieties. They also vary in the flower shape and color and the blooming seasons. So, to grow them well, you will need stick to the particular type you have chosen but most of them share the same requirements. Clematis plants are known as plants that love their feet in the shade and their faces in the sun. This means that their soil should be kept cool even when the vines are set on sunny location. So, you may plant some ground cover around the clematis. Also, a 2-inch layer of mulch can keep the roots cool and moist. And when it comes to the supporting system, they can be supported with different trellis, fences or even arbors for some larger types. Clematis can be also grown in containers, but they look better when in combo with trellis. Here are several ideas that may inspire you to add this eye-catching plant in your outdoors too. Clematis require low maintenance, except when it comes to watering. They should be watered about an inch weekly and more deeply during dry spells. Also, you should replenish the mulch every spring. They can be found in different colors, so you can pick the ones that look best in your outdoors. These blooming plants can also look good in pots, making them perfect decor for your patio, front porch, balcony etc.